Truth be told I hate doing dishes, but after what I just discovered, I have been an excited dish washing maniac! 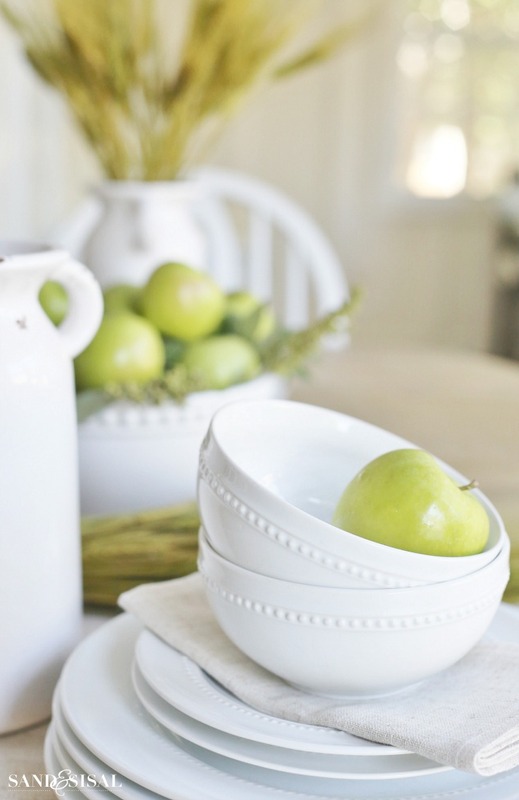 This past week I was doing a photoshoot for an upcoming holiday tablescape and as I was going through the pictures I noticed how horrible my white dishware looked. 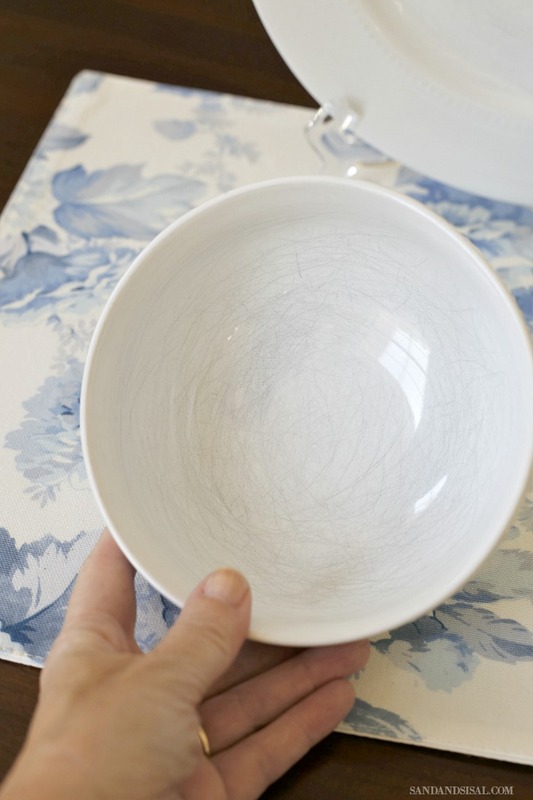 There was not a single dish that wasn’t marred with ugly gray marks and scratches. Besides the millions of tiny scratches covering the insides of every plate, bowl and mug, the dishes are still in decent condition. I seriously contemplated going out and buying brand new dishes but that just seemed wasteful. 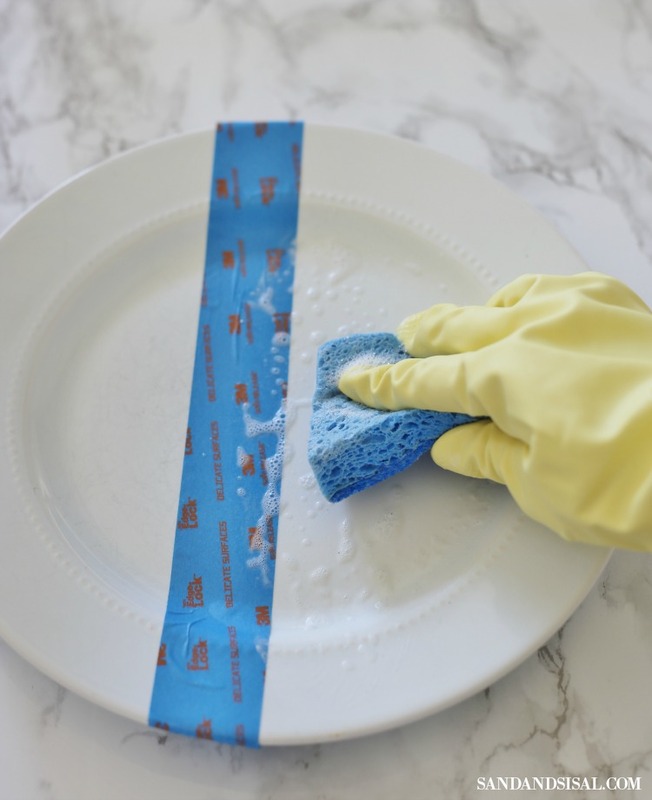 So I headed to my cleaning closet on a mission to find out How to Remove Utensil Scratches from Dishes, and I am so excited to share the solution with you! PS- This is NOT a sponsored post, I am just so over the moon thrilled I had to share! Drum roll please….. the secret, amazing miracle mark removing cleanser is Bar Keepers Friend (<–Amazon affiliate link)! I had originally bought Bar Keepers Friend to clean some rusty marks off our brand new stainless steel sink that an old cookie tray had left. I had always heard how people loved the stuff for cleaning all types of things, but never to remove the scratches on dishes. Well now I know! Removing the scratches/mark from the dishes is easy. For demonstration sake, I taped off one side of the dish with painter’s tape. I recommend using kitchen gloves, especially if you have sensitive skin. Pour a generous amount of the cleaning powder onto the dish. With a wet sponge (but not too wet) start scrubbing the powder all over the dish. You want to form a paste. I used a kitchen sponge with a lightly abrasive scrubbing side. You will notice almost instantly the marks and scratches start disappearing. Scrub for one minute. It does take a bit of elbow grease. Rinse completely and check out your results. Repeat where necessary. Just look at those results! Seriously amazing. I hope you give it a try for yourself! If you would please excuse me… I have a pile of dishes to clean and renew! Wow Kim, who knew ?? I even bartended years ago and had never used it before. I am just now hearing all these marvelous ways to use it. This one really is a miracle though ! Thank you for doing the leg work for all us readers, or should I say, “finger” work ? Its definitely worth the scrubbing though, compared to forking out money for a new set of dishes. Have a great day. I have some marks on my lighter colored Fiestaware dishes, I have a can of this stuff somewhere, I’ll have to try it on those! Thank You! Thanks Mary! I hope you like the results! There are few things in this world that Bar Keepers Friend can’t solve. Bar Keepers Friend for president! Thanks for the tip. I’m going to give it a shot. YES!! 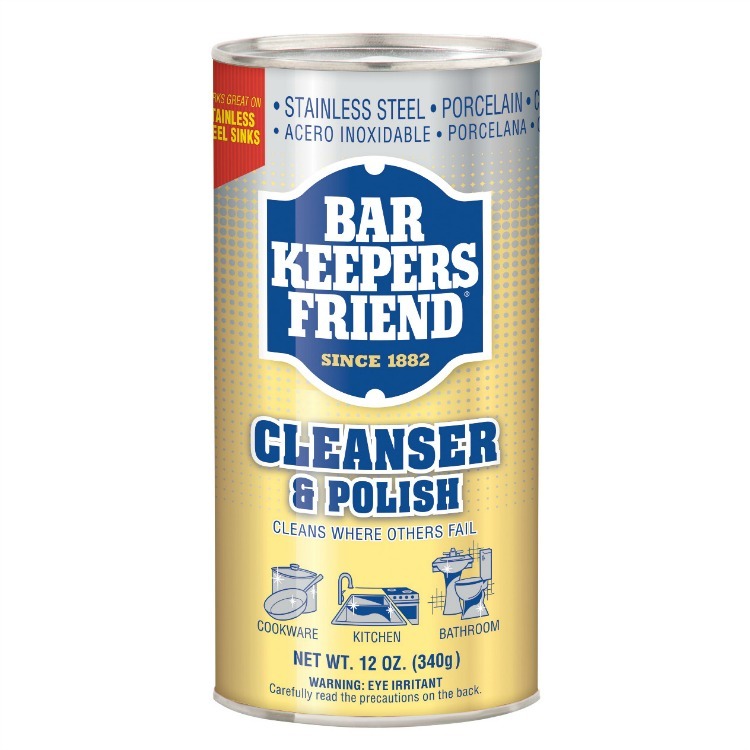 Bartenders Keepers Friend and BonAmi are my faves for cleaning delicate and porous items. I stock pile it and use it daily for my stainless steel sink. Which I then give a light wipe down with olive oil. Oooo, I havent wiped my sink down with olive oil. Thanks for that tip Barbara! Kim THANKS FOR SHARING THIS. All of my light colored Fiestaware is scratched up. Going to try this for sure. Awesome! I have used it to shine up stainless steel pans but I haven’t tried it on dishes. Thanks for the tip! I want to know how to keep my dishes from getting gray marks again. I’ve spent half a day cleaning them only to have the marks come back at first use. What a waste of time! My dishes are white Pfaltzgraff stoneware. I must need new silverware? I thought Fiesta wouldn’t mark maybe but see someone else’s did. 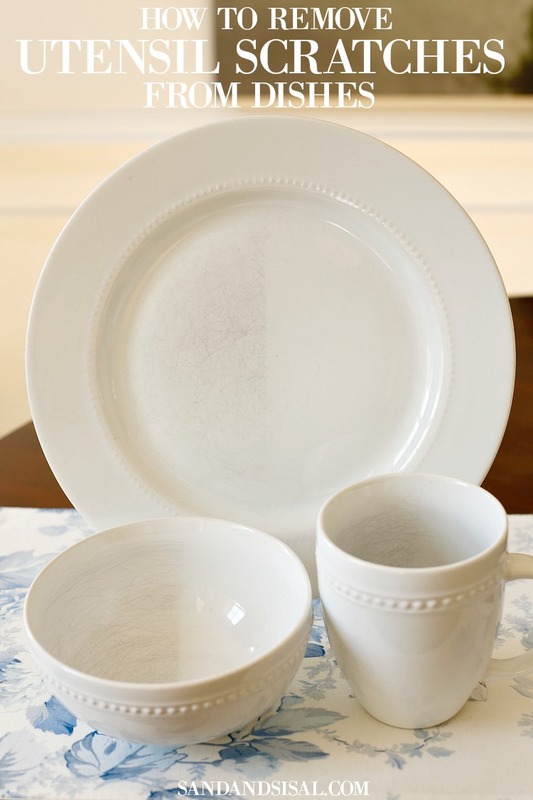 I have had the same white dishes for 26 years (because Mikasa French Countryside will NEVER go out of style!) and I am SO going to do this! Thanks, Kim! Thanks Viv! It’s not a cure all but it certainly makes them look so much better! So glad I saw this tip! 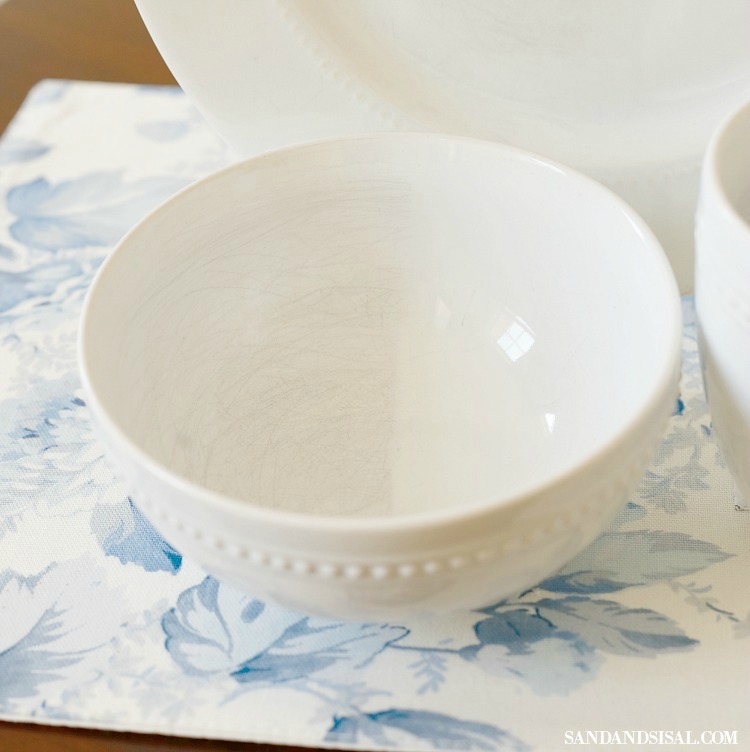 I have the same white dishes from Target! I bought them a month ago, a bit hesitantly, knowing they may show scratches. But I love them and now I’ll know how to clean them, thanks! Hi, My name is Christina and I work for Bar Keepers Friend. I just came across your blog on Pinterest. Thank you so much for your kind words. I’ll be sure to share your blog on our social media platforms. HI, My name is Christina and I work for Bar Keepers Friend. This is a great article and we thank you for the great comments. Thanks for the tip Carol! I’ve wondered about that. I suspect that the older our silverware, the more markings it makes. Do you think? I’m just wondering if there’s anything else you can use instead of bar cleaners friend? Cause I’ve never seen or heard of it in Australia! What if you have darker colored dishes with scratch marks? I’m afraid it will take off the color. Hi Marcia! I seriously do not know the answer to that one. I haven’t tried it any of my colored plates. So I would take the cautious route and not attempt it. I love Bar Keeper’s Friend! Great tip. I have also used the Magic Eraser to remove silverware marks from my Fiestaware. Thank you! I’ll have to try the magic eraser!